CCC's Alone in the Dark Launch Site: Reviews, Previews, Cheats, Videos, Screenshots, and more! Alone in the Dark will have you on the edge of your seat! Atari brings an all-new AITD game to the horror series that started it all...Got guts to play? Keep the fire burning! Players control Edward Carnby, the main character from the original Alone in the Dark, on a thrilling journey through a dark and terrifying re-creation of New York�s Central Park where he must discover the truth behind a dark conspiracy. 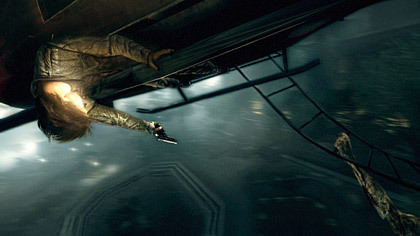 With inspiration from the presentation style of popular action TV dramas, Alone in the Dark will be split into a number of distinct episodes. Alone in the Dark will provide a complete next-generation, action packed experience within a highly detailed, free roaming environment, featuring a mixture of real-time physics and full environmental interaction. Ready to get the most out of Alone in the Dark? Don't forget to check out our cheats section, where you'll find cheats, tricks, hints, and everything you need to know about secrets and unlockables included in the game. Keep checking back for more!